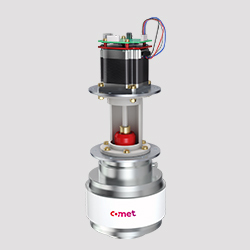 Comet Motorized Capacitors offer the latest integrated drive technology for vacuum capacitors at the best price-per­formance ratio. A single communication protocol for RS232 and RS485 provides flexibility in a wide range of applications. 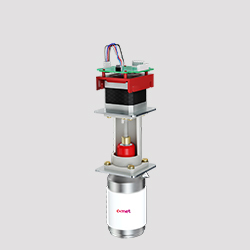 Motorized Capacitors are the ideal solution for high-precision operation. Besides ensuring highest accuracy, motorized capacitors simplify procurement with an easy-to-install subsystem. 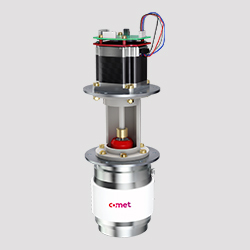 The core component of the Universal Motorized Capacitor is a Comet variable vacuum capacitor, mounted with an insulating cover, coupler and stepper-motor. A durable, backlash-free Comet-coupler connects the capacitor to the drive system. Integrated flanges ensure easy mounting in the system. Appropriate high-voltage insulation between the capacitor and the flanges is also included. Using a stepper-motor, the capacitance of the variable capacitor can be tuned precisely between user selectable limits. Further technical information can be found in our Service Bulletins SB-60, SB-63, SB-64 and SB-69. Two sizes of integrated drive systems are available for different capacitor series.